The amount of 0.3 USD has been deposited to your account. Accounts: U13782106->U563****. Memo: Викторина от Fairmonitor.com. Date: 10:30 02.09.18. Batch: 226948908. The amount of 0.1 USD has been deposited to your account. Accounts: U13782106->U563****. Memo: Викторина от Fairmonitor.com. Date: 18:37 04.09.18. Batch: 227212364. The amount of 0.3 USD has been deposited to your account. Accounts: U13782106->U563****. 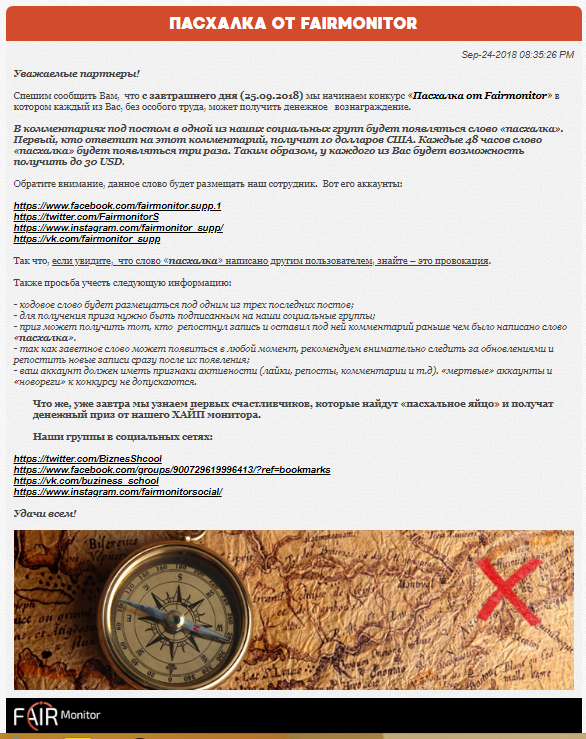 Memo: Викторина от Fairmonitor.com. Date: 13:39 06.09.18. Batch: 227420240. The amount of 0.3 USD has been deposited to your account. Accounts: U13782106->U563****. Memo: Викторина от Fairmonitor.com. Date: 16:06 07.09.18. Batch: 227548431. The amount of 1.88 USD has been deposited to your account. Accounts: U2189920->U563****. Memo: Бонус за активность!. Date: 18:40 09.09.18. Batch: 227763035. The amount of 0.3 USD has been deposited to your account. Accounts: U13782106->U563****. Memo: Викторина от Fairmonitor.com. Date: 14:37 14.09.18. Batch: 228344182. The amount of 0.3 USD has been deposited to your account. Accounts: U13782106->U563****. Memo: Викторина от Fairmonitor.com. Date: 09:49 15.09.18. Batch: 228426395. The amount of 0.1 USD has been deposited to your account. Accounts: U13782106->U563****. Memo: Викторина от Fairmonitor.com. Date: 09:20 16.09.18. Batch: 228528008. The amount of 0.3 USD has been deposited to your account. Accounts: U13782106->U563****. Memo: Викторина от Fairmonitor.com. Date: 15:13 29.09.18. Batch: 230063384.